A 46-year-old man armed with an assault rifle opened fire at a synagogue in Pittsburgh's Squirrel Hill neighborhood on Saturday morning, the Jewish Sabbath, killing 11 people and injuring four police officers before being taken into custody, according to officials and law enforcement sources. A prayer service was taking place at the Tree of Life synagogue in Squirrel Hill when gunfire erupted, and officials said the shooting, which officers responded to just before 10 a.m., is being investigated as a hate crime. Eight men and three women were in the attack, according to charging documents. Six people were injured, including the four male officers, three of whom were shot. One officer was described in the affidavit as critically wounded, and the two civilians were in stable condition. The Anti-Defamation League, which tracks anti-Semitism in the United States, said in a statement this "is likely the deadliest attack on the Jewish community in the history of the United States." 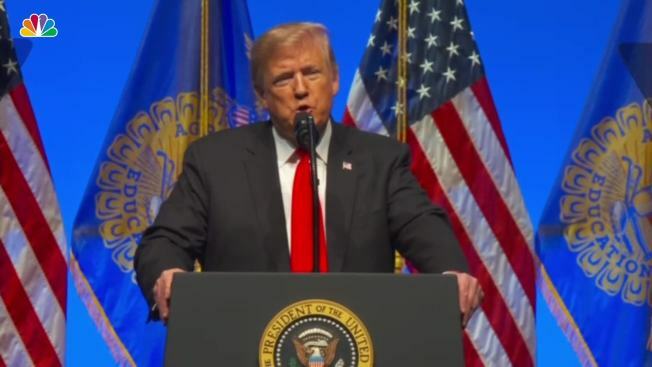 "Please know that justice, in this case, will be swift and it will be severe," Scott Brady, the chief federal prosecutor in western Pennsylvania, said at a news conference, characterizing the slaughter as a "terrible and unspeakable act of hate." "The nightmare has hit home in the city of Pittsburgh," said public safety director Wendell Hissrich, who described the "very horrific crime scene" as "one of the worst that I've seen." 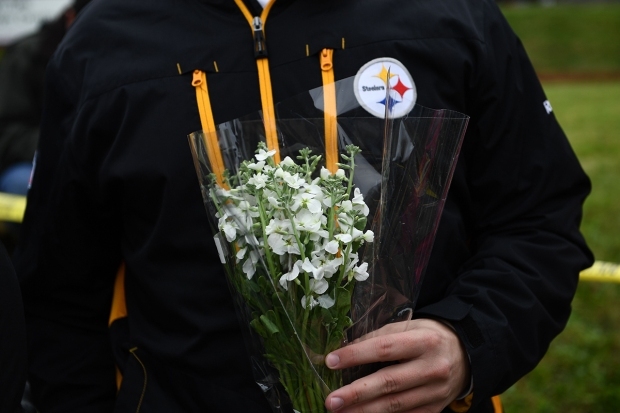 The survivors included Daniel Leger, 70, a nurse and hospital chaplain who was in critical condition after undergoing surgery, brother Paul Leger told the Pittsburgh Post-Gazette. Daniel Leger was scheduled to lead a service Saturday morning, his brother said. Bowers was allegedly on his way out of the synagogue when police arrived, NBC News' Tom Winter reported. The gunman shot one of the first responding officers in the hand, and another officer was wounded by "shrapnel and broken glass," according to the affidavit. 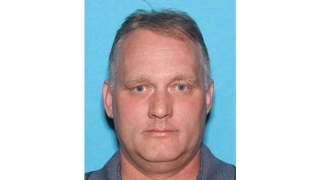 Police then engaged with Bowers inside the synagogue, where two more officers were shot multiple times before he surrendered. Social media accounts under Bowers' name included anti-Semitic comments. Earlier Saturday, a post under his name made hateful comments about a Jewish-American organization that helps refugees, NBC News’ Pete Williams reported. Many other comments on the account also featured disparaging comments about Jews. The account also posted comments critical of President Donald Trump. Officials said he was not known to law enforcement prior to the shooting. Police departments across the country, from New York City to Los Angeles, said security was being increased at local synagogues in response to the attack. Speaking at a previously scheduled event in Indiana, Trump decried the "wicked act of mass murder" as "pure evil." He said anti-Semitism "represents one of the ugliest and darkest features of human history." When asked if all places of worship should be armed, Trump said that "it's certainly an option in this world." Pennsylvania Gov. Tom Wolf described the incident as "an absolute tragedy" and called for action to "prevent these tragedies in the future", saying, "Dangerous weapons are putting our citizens in harm’s way." He later ordered flags in Pennsylvania to be flown at half-staff. The tree-lined residential neighborhood of Squirrel Hill, about 10 minutes from downtown Pittsburgh, is the hub of Pittsburgh’s Jewish community. More than a quarter of the Jewish households in the Pittsburgh area are in Squirrel Hill, according to a Brandeis University study of the Greater Pittsburgh Jewish community. More than 80 percent of Squirrel Hill residents said they had some concern or were very concerned about the rise of anti-Semitism, the study said. And many also said they experienced incidents of anti-Semitism in the past year, including insults, stereotypes, physical threats and attacks. The ADL warned earlier this year that 2017 saw the largest single-year increase on record of anti-Semitic incidents, a spike of 57 percent from the previous year. The 1,986 incidents included physical assaults, vandalism and attacks on Jewish institutions. And a Friday report from the ADL said that far-right extremists have ramped up an intimidating wave of anti-Semitic harassment against Jewish people ahead of next month's U.S. midterm elections. Posts were sometimes orchestrated by leaders of neo-Nazi or white nationalist groups. In 2010, Tree of Life Congregation — founded more than 150 years ago — merged with Or L’Simcha to form Tree of Life*Or L’Simcha. Tree of Life Rabbi Jeffrey Myers posted a column on the congregation's website in July lamenting Washington's inaction against gun violence. "Despite continuous calls for sensible gun control and mental health care, our elected leaders in Washington knew that it would fade away in time," he wrote. "Unless there is a dramatic turnaround in the mid-term elections, I fear that the status quo will remain unchanged, and school shootings will resume. I shouldn’t have to include in my daily morning prayers that God should watch over my wife and daughter, both teachers, and keep them safe. Where are our leaders?" And just three days before the shooting, Myers noted in another column that people make time to attend funerals, but not for life’s happy occasions. He ended his column with words that now seem all too prescient. Cathie Mayers, who lives in the Point Breeze neighborhood next to Squirrel Hill, described Tree of Life as a well-known place in the area. She called the shooting "surprising" and "very, very saddening," telling NBC that "it’s unusual for Squirrel Hill, but this is a very, very surprising incident for Pittsburgh, especially at a place of worship." The Holocaust Memorial Museum in D.C. condemned the attack on the Tree of Life synagogue and called on "all Americans to actively work to promote social solidarity and respect the dignity of all individuals." Trump's daughter Ivanka Trump, who converted to Judaism ahead of her marriage to Jared Kushner, tweeted: "America is stronger than the acts of a depraved bigot and anti-semite. All good Americans stand with the Jewish people to oppose acts of terror & share the horror, disgust & outrage over the massacre in Pittsburgh. We must unite against hatred & evil. God bless those affected." The Council on American-Islamic Relations also condemned the "heinous and cowardly attack on a house of worship," saying in a statement, "This attack is on American values and principles of humanity, and we all need to come together to restore civilized values to our society." Israeli Prime Minister Benjamin Netanyahu tweeted that he was "heartbroken and appalled by the murderous attack on a Pittsburgh synagogue today. The entire people of Israel grieve with the families of the dead. We stand together with the Jewish community of Pittsburgh." "We are incredibly saddened to hear of this morning's tragedy at the Tree of Life synagogue in Pittsburgh. We send our thoughts and prayers to all those affected," the Pittsburgh Penguins tweeted. Canadian Prime Minister Justin Trudeau tweeted that "Canadians’ hearts are with the Jewish community in Pittsburgh today."